DockSearch.com - Your place to find dockage for your boat and rent or sell your boat dock space or slip. This dock is at the S. end of Fort Myers Beach within 1 mile of the Gulf. The current lift has a capacity of 9000 pounds but larger lift could be installed. 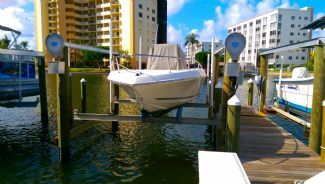 You do not have to be a condo member to own this dock which is quite rare. For sailboats there is a draw bridge giving gulf access. Sale Price: $65,000 Mostly listings charge by "Flat Rate" per month. Some listings may charge "By Foot" per month.